CORVALLIS, Ore. – Oregon fishermen and seafood sellers are reaching new clients, thanks to free, guided tours of docks and markets that demystify the process of buying seafood. The initiative is called Shop at the Dock and is run by Oregon Sea Grant and the Oregon State University Extension Service. They’ve been offering tours every summer in the coastal town of Newport since 2014. In 2017 and 2018, a slightly altered version of the event expanded to Warrenton, where attendees toured the docks, ventured to the Skipanon Brand Seafood cannery or Warrenton Deep Sea Market, and learned where to buy seafood between Astoria and Cannon Beach. Also in 2018, tours debuted in Garibaldi. Participants visited the port and the Fishpeople Seafood Market, met fishermen and learned to make smoked tuna tacos from the chef of the Garibaldi Portside Bistro. More tours are planned for Garibaldi in 2019, including outside the summer. Joe Phillips is one of the fishermen who sold seafood during the tours in Newport. He said the event builds long-term relationships with customers. He’s seen people return to buy halibut or come back the next summer to buy albacore after they’ve studied up on how to can it. “You definitely see a boost in your profits,” he said. Participants in Newport spent a total of about $20,000 during the tours in 2016 and 2017 combined, said Kaety Jacobson, a former fisheries specialist with Oregon Sea Grant and Extension who led tours there. 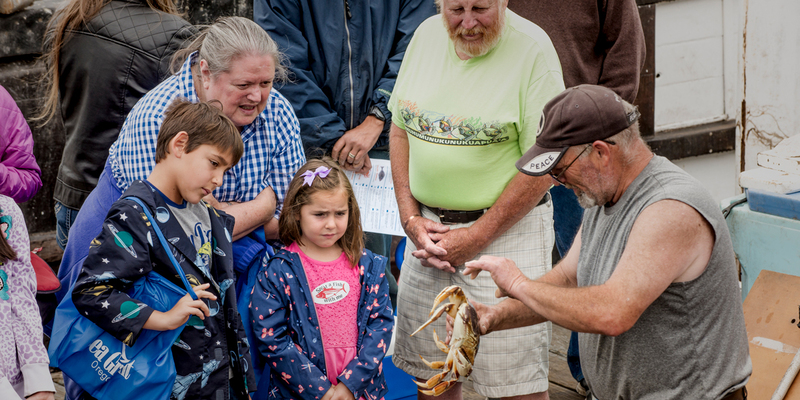 In Warrenton in 2017 and 2018 combined, participants spent nearly $800 on seafood plus about $2,800 on lodging, meals, entertainment and other items, said Amanda Gladics, a coastal fisheries specialist with Oregon Sea Grant and Extension. More than 1,200 people have participated in all the tours since 2014, according to organizers. During the tours, attendees learn what seafood is in season, how it’s caught, whether it’s sustainable, and how to identify and buy high-quality fish and shellfish. They also learn about the different fishing boats, and they take recipes home with them. The program started after a survey found that consumers were intimidated by the process of buying seafood at a dock, Jacobson said. Those who did buy seafood directly from fishermen had learned to do so from a friend or family member. So Oregon Sea Grant and Extension decided to become that “friend” and teach others, she said. U.S. Sen. Jeff Merkley recognized Shop at the Dock at a town hall meeting in Newport when he awarded Jacobson a flag that had flown over the U.S. Capitol. “The Sea Grant program is a textbook example of a smart and targeted investment in local communities that helps create economic growth,” he wrote in a Facebook post following the meeting. For those unable to attend the tours, they can watch videos of Jacobson explaining how to buy fish on the dock (youtu.be/2lspr6Uh_Dk) and at a grocery store (youtu.be/ELZ3EvVVzXc). More information about Shop at the Dock is in a video at youtu.be/dGhqeF7a-4Q.